How's Life? 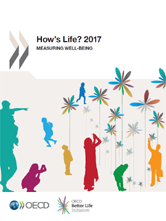 2017 charts the promises and pitfalls for people's well-being in 35 OECD countries and 6 partner countries. It presents the latest evidence from 50 indicators, covering both current well-being outcomes and resources for future well-being, and including changes since 2005. During this period there have been signs of progress, but gains in some aspects of life have been offset by losses elsewhere. Current well-being: How's Life in 2017? Change in current well-being: Is life getting better for people? Migrants’ well-being: Moving to a better life? HOW'S LIFE IN THE CZECH REPUBLIC? HOW'S LIFE IN THE NETHERLANDS? HOW'S LIFE IN NEW ZEALAND? HOW'S LIFE IN THE SLOVAK REPUBLIC? HOW'S LIFE IN THE UNITED KINGDOM? HOW'S LIFE IN THE UNITED STATES? HOW'S LIFE IN COSTA RICA? HOW'S LIFE IN THE RUSSIAN FEDERATION? HOW'S LIFE IN SOUTH AFRICA?